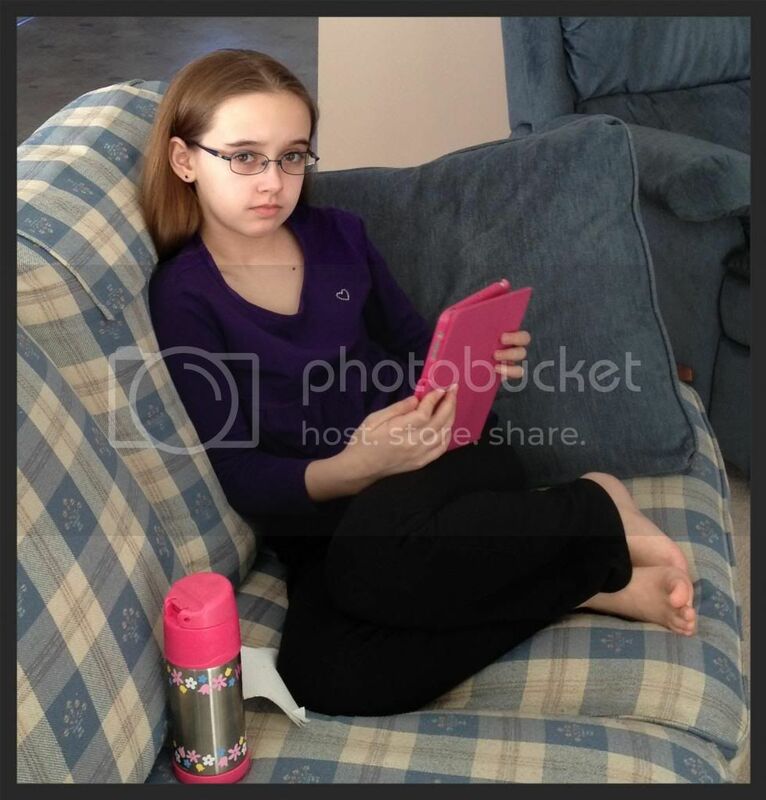 Unexpected Homeschool: And... More Sick Days. You know those weeks that you plan and tell yourself that nothing is going to keep you from sticking to schedule, but inevitably everything conspires to prove you unable to even remotely keep to a schedule? Ya, that was this week. Plenty of school happened, and when I look back at our homeschool tracker I can see *almost* every last school item scheduled was completed, eventually. What it doesn't show is that our lunch time break was almost non-existent on the days we were home. We ate and went right back to work, without the 1.5 hour break Amber is supposed to have mid-day. Write your own Conversational Hearts... First one said "I Love Mommy"
Amber still wasn't feeling really great again this week. The intestinal bug from almost 2 weeks ago did a number on her intestines. I finally managed to get back to normal even with IBS, but she was still a no go for food processing. Food go in, nothing come out. Sigh. She missed 1 out of 3 nights of dance this week, plus has been puny every evening. I should not have let her go the two nights I did, but she was fine before dance. Just felt really crummy afterwards. After several calls to the doctor this week and varied treatments at home, they had me bring her in on Thursday. Two hours and an x-ray later, all looked well and she was declared good, just slow to recover. Seems like the treatments at home worked. Then this morning the dreaded call came. Why, oh why, is this how it ALWAYS goes. I should start demanding the radiologist full review immediately. We never have good luck with initial x-ray viewings. Turns out Amber does have some still unresolved issues and she's now taking hefty doses of medication to kick start her intestines. She is feeling plain awful from the medicine, but nearly content vegging on the couch watching TV and texting the friend she was supposed to see today. Both girls are sick, with something different, so it works out well - I guess. Amber was able to complete school work on and off during the week. The afternoons were our most productive. She could not manage to get out of bed even remotely on time this week. The night we skipped dance turned out to be the most productive school day. Amber felt okay to sit, but couldn't walk around much. We forged ahead with small breaks all afternoon until dinner time. Her work was even well done. God and Family book and building her "pizza" project. 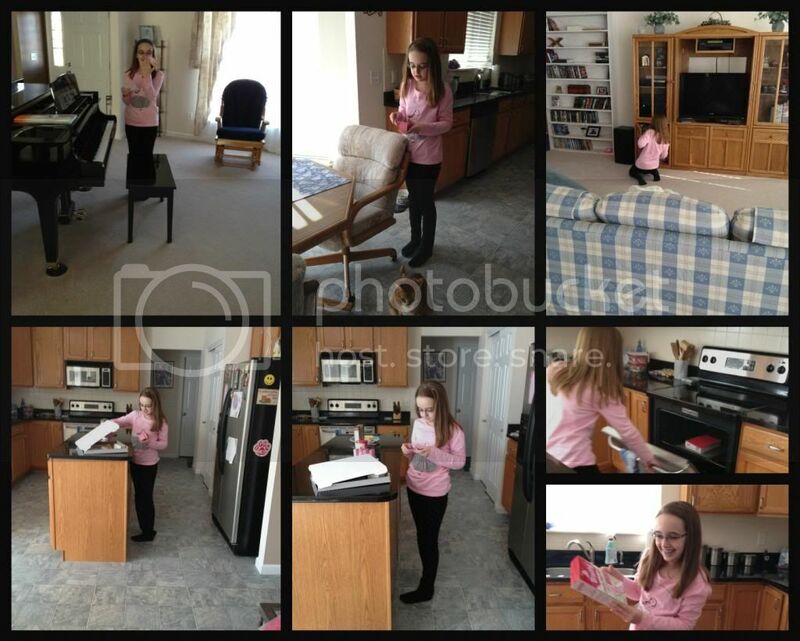 Oddly enough, the top right picture she is working on the book at a local Italian pizza restaurant. 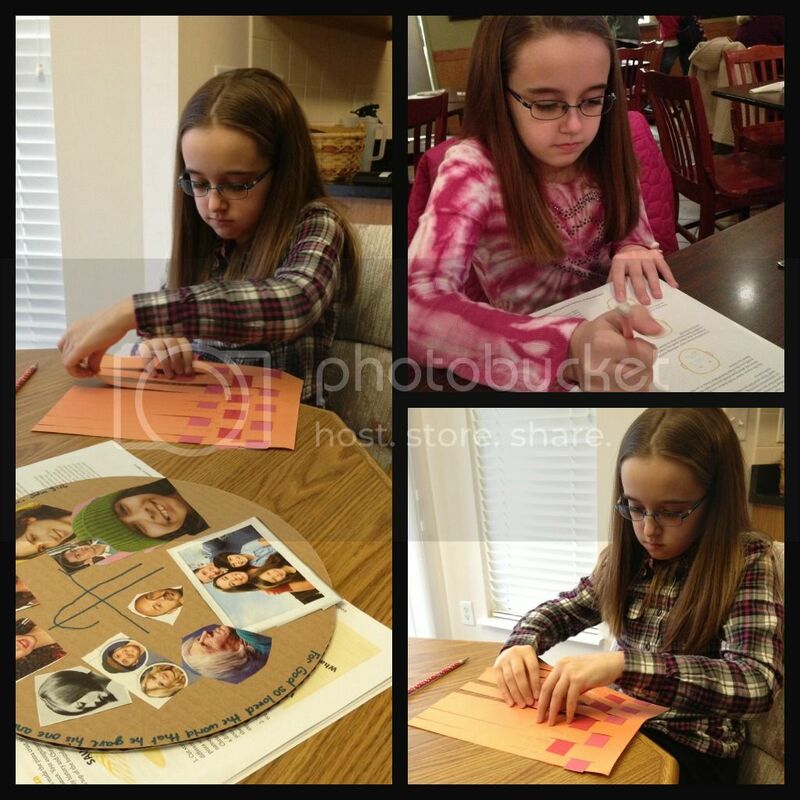 Due to illness last week, Amber missed her Girl Scout troops all-nighter where they worked on the God and Family award. This means that we have the entire book to do at home before next Friday when Amber meets with our church's Director of Christian Education to receive approval for her award. We replaced our normal religion curriculum with the God and Family book this week. We have made good progress and plan to finish this weekend. I'll see if that actually happens, but we have another week to finish still. Amber and I also spent some calmer down time together this week playing a new game, at least for Amber it was new. Even though Fred and I both play chess, neither of us ever tried to teach Amber. We are just pathetic parents at times. Amber loves playing chess and in just 4 days is approaching my level of expertise. I only win because I am an adult who has lost many more games than her. She did manage a deadlock one game though. That was a bit scary, for me. Perhaps Fred does need to take over this endeavor. But in all honestly, it is amazing to see the wheels moving in her head while she plans an attack. Even though I took Amber to the doctor on Valentine's Day, she was honestly feeling a little better. We had a fun day planned and still managed to enjoy most of our day. After a couple hours at the doctor we went out to lunch at a place that is just our own. Fred has never been. Only Amber and I go there together. She loves having that special place. Then at home she made Valentine's Day cards for us while I set up a treasure hunt for her. Since Amber was a very little girl, I've been making treasure hunts for her. Early on it was poorly drawn pictures to each spot where she found a new picture. Now it is little riddles at each spot until the end. Amber loves these and even made one up for her dad this year. Fred was a good daddy that went on his treasure hunt the minute he walked in the door, even though he was clearly wiped out from work. Treasure hunt, to find her Valentine Candy. No big treasure at the end here. I know this post is fairly devoid of school related stuff, and I promise I'm going to write another one tonight or tomorrow about our new curriculum, which is exceeding all expectations. Yet, I have one more thing for this non-schooly update post. I'm worried about Amber. Not the normal worry, but about her health. She goes for her annual checkup in less than two weeks and it couldn't be soon enough. See, I'm diabetic and come from a rather large extended family that includes more than our share of diabetics. I'm always on the watch for it in Amber and very particular about her diet and exercise. Lately the last month or so, Amber has been not quite right. I'd love to chalk it up to a growth spurt, or the age, or even the dreaded puberty. She's continuously thirsty, and almost as often running to the bathroom. She is ravenously hungry, all the time, even when her intestines are not functioning at their best due to that virus. She's not gaining any weight from all the food though, she's actually lost a couple of pounds. She's extremely moody and downright grouchy. And tired... oh so tired. Even with 12 hours of sleep she wakes with dark smudges under her eyes. Dance is putting her over the edge into complete exhaustion and this session's daily schedule isn't as difficult as the last. 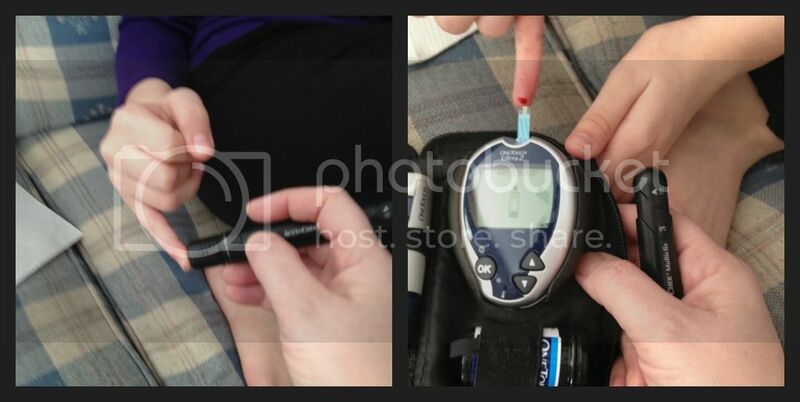 The piece that has me in a small tither is her blood sugar readings. Nothing has been so high that I need to race Amber to the ER or even call her doctor. But her fasting sugar levels are above the diabetic range. They are higher than mine! Seriously, and my fasting numbers are the ones we have never been able to control well. The rest of the day she is mostly okay, again usually higher than me at every testing, but still in a normal-ish range. So, I am waiting for her doctor's visit with anticipation and dread. I will be brave enough to ask for and gain an A1C blood test. I'm never going to be able to put this aside until I do. Hopefully, it's just her age and I'm an overly sensitive diabetic mother. That's been our week. I'm so thankful we homeschool during times like this. I can't fathom how much homework there would be from an illness like this. Here's hoping next week is more about school than illness! I'm sorry to read your girls haven't been feeling well. I am also diabetic and know what that would mean to have a child with this disease. It is good that you are seeking answers. I am also thankful for the flexibility of home education. I often think how blessed we are to have this option. I love all your collages. I love the fact your little one knows chess so well. I am so sorry Amber hasn't been feeling well. I so hope the doctors visit will provide the answers you want. Homeschooling is lovely in that it lets us take time off for days we or our kids don't feel well. 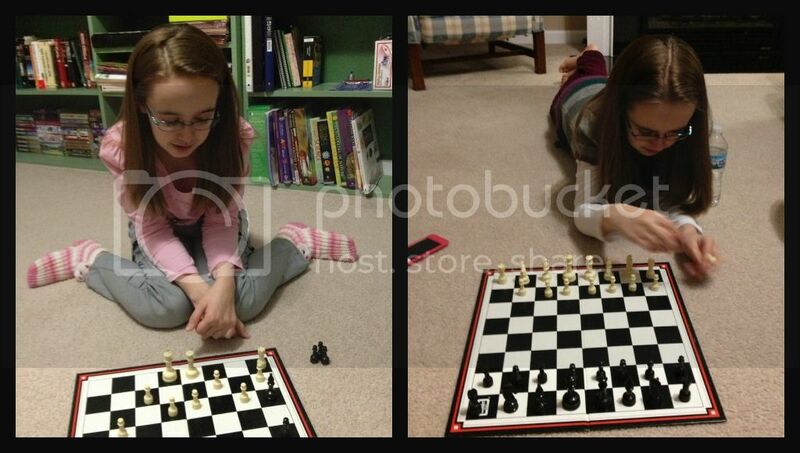 Love that you taught Amber chess. We tried a couple of times but I don't play we'll enough to teach Kei. We have been playing Backgammon. I love the treasure hunt idea. How fun. We will keep Amber in our prayers and please let us know what you find out. Oh, gosh, so sorry! I sometimes wonder about my youngest with SPD. He eats all the time...and gets very agitated when I say he can't. And something he smells "sweet". But the pedi doesn't see anything amiss and won't test. Hang in there! That's my worry too, that pediatrician won't test. But, I've got all the supplies for testing and the numbers to show that things aren't what they used to be. I'm praying that it is just a change in her body chemistry. You have a beautiful little girl. I hope she feels better soon. I also hope you get all the answers you need regarding her health. I'm sorry to hear Amber's been feeling poorly. Just imagine what a burden it would have been a year or so ago, before you could adjust your days around something like this. I hope you get some answers at the appt- I will pray for her. I'll pray it's just been lingering illness that's keeping her down. The treasure hunt sounds like fun! My mom did that for us one Easter with the daycare kiddos and we had a blast! I am sorry Amber hasn't been feeling well. We had illness at our house this week too. It sounds like you were still pretty productive, so that's good! I am so sorry Amber isn't feeling well :( Wow, you accomplished a lot, even with illness! I hope the visit to the doctor helps ease your fears, or at least gives you solid answers.